The Lucasfilm empire is built upon two rock-solid foundations: Star Wars and Indiana Jones. Both became phenomenally popular beyond even their creators' wildest dreams, inspiring books, comics, toys, games and television programming. But while Star Wars is, more or less, the sole vision of George Lucas, credit for the Indiana Jones series is spread equally between Lucas, Steven Spielberg and Harrison Ford (not to mention such key collaborators as John Williams, Dennis Muren and Ben Burtt). Given the, shall we say, mixed reception of last year's Blu-ray release of the Star Wars saga, fans have been awaiting the high-def debut of Indy with equal parts anticipation and nervousness. How will the movies look? Will all of the extras be ported over from the DVDs? Will Toht's screams at the end of Raiders be replaced with, "NOOOOOOO!" Yeah, forget all that extraneous "Indiana Jones and the" nonsense. Despite what it may say on the packaging, this was, is and always shall be simply Raiders of the Lost Ark. Even if you were around back in 1981, it may be hard to remember just what an out-of-nowhere blast of awesomeness Raiders was at the time. It had an ambiguous title, a period setting and a star who was a hero to many of us but hadn't yet demonstrated that he could carry a movie where he wasn't playing Han Solo. But by the end of the breathless opening sequence, audiences were hooked. The beginning of the movie actually serves two purposes. First, it sets the bar high for the level of action and adventure you can expect for the rest of the movie. But it also tells you pretty much everything you need to know about Indiana Jones, whether you realize it or not. We'd never heard of this character before but by the time Indy climbs aboard that seaplane, we felt like we'd been watching Harrison Ford explore tombs and temples our entire lives. It's important to remember that Raiders isn't just The Harrison Ford Power Hour. The supporting characters, including Karen Allen's strong, independent Marion and John Rhys-Davies' resourceful Sallah, are more than capable of keeping up with Indy. And the bad guys, as played by Paul Freeman and Ronald Lacey, are as bad as they come. I've always felt that one of the main reasons the other films in the series don't quite measure up to the original is that none of the villains are as vivid or menacing as Belloq and Toht. First and foremost, Raiders is simply great fun, a wild ride of a movie. The reason it holds up and you want to take the ride again and again is you grow to love these characters. The secret to the movie's success isn't the breathtaking stunts or face-melting effects or even John Williams' instantly iconic score. It's simply Indy's crooked little smile and two words: "Trust me." Indiana Jones returned three years later and, for reasons I've never fully understood, one year prior to the events in Raiders. But this time, all the pieces of the puzzle didn't quite click into place. The hand-wringing over the violence in this and the same year's Gremlins helped usher in the PG-13 rating. But in retrospect, the darker tone is one of the best things about Temple of Doom. The movie gets off to a good start with a production number and elaborate fight sequence in Shanghai's Club Obi Wan (cute). But unlike Raiders, which has a very clear-cut goal and is told with laser-like precision, the set-up to Temple is extremely muddled. Indy is asked to retrieve one of the sacred Sankara stones, stolen from a village by Mola Ram (Amrish Puri), leader of a Thuggee cult. He's also abducted the village's children but that seems to be less important than getting the stone back. We don't even get to the Temple or Mola Ram until about an hour into the picture. Until then, we're forced to deal with nightclub singer Willie Scott (Kate Capshaw), a useless scream factory more worried about her nails than anything else, and Short Round (Ke Huy Quan), that irrepressible Shanghai street urchin. These characters are almost impossibly irritating, especially when compared to Indy's support team last time. Shorty at least proves himself useful by the end of the movie. Willie, on the other hand, goes from mildly annoying to actively obnoxious. Despite its convoluted story and less-than-endearing characters, Temple of Doom does deliver in its second hour. It's a dark, dangerous world but Indy navigates his way through it with his usual aplomb. Temple of Doom is probably the closest we'll ever get to a cult Indiana Jones movie. It requires you to pick and choose its best moments and try your best to ignore its shortcomings. There are those who feel that Last Crusade is almost as good as, if not better than, Raiders. I am not one of them. I view the movie more kindly now than I did back in 1989. I originally saw it as part of a double feature with Star Trek V, which admittedly poisoned my opinion of the entire evening. Watching it again, I found it had more strengths than weaknesses. This time out, the new additions to the cast benefit the movie instead of weighing it down. Casting Sean Connery as Henry Jones was an inspired coup and River Phoenix proved to be an unexpectedly perfect young Indy in the entertaining prologue. The plot gets back to basics with a simple, easily understood goal: the Holy Grail. Even our old reliable bad guys, the Nazis, are back, although main villain Julian Glover is a bit bland compared to the Raiders baddies. But while the movie gets a lot right, it's not without its flaws. Things occasionally cross the line separating silly fun and just plain silly. As much as I love Denholm Elliott, the film's biggest misstep may have been giving his Marcus Brody an expanded role in the action. The second he steps off campus, he turns into your wacky doddering old grandfather. Everyone would have been better off if Indy had suggested Marcus wait back at the hotel until things were taken care of. Raiders was a well-oiled machine, a near-flawless example of the adventure movie. Last Crusade stutters a bit but never completely stalls out. It's an engaging return and its expansion of Indy's personal history adds an element that makes it a notch more interesting than your run-of-the-mill sequel. And then there's this. Anticipation ran high when Spielberg, Lucas and Ford reteamed for the fourth Indy adventure. Personally, I was skeptical. It had been nearly 20 years since Last Crusade and you can count on one hand the number of successful sequels that arrive that long after the fact. But with the long-awaited return of Karen Allen as Marion, maybe this would buck the odds and be Indy's victory lap. It didn't. Even at my most critical, the one thing I always said about the Indiana Jones movies is at least they all start off well. This one sends up warning signs within its first minute with its goofy CGI prairie dog schtick. While Raiders had you firmly under its spell by the end of its opening sequence, Crystal Skull has you checking the disc to make sure that you've actually got an Indiana Jones movie and not a direct-to-video Mummy sequel. Apart from a few die-hards, the movie was almost universally seen as a major disappointment at best. No doubt you've already seen the movie and know what side of the debate you're on. You might be considering giving it another chance, thinking maybe it isn't as bad as you remember. Let me assure you, your first instincts were correct. It really is that bad. No one involved appears to have brought their A-game to the project, making the movie feel more like Indiana Jones and the Contractual Obligation. Even if you're one of the few who kind of enjoyed Crystal Skull (and if you are, I'm genuinely happy for you. I wish I had. ), this is nobody's favorite Indiana Jones adventure. I guarantee that this is the disc you will play the least out of this set. The video quality on especially Discs One, Two and Three is comparable across all three installments. Of the three, Raiders in particular has been given a new 4K transfer and extensive restoration. Probably the best thing that can be said for each is that the visual presentations are pleasingly and richly cinematic. Grain is moderate and seldom excessive, but its presence insures that the films retain their period look. Detail is excellent on the whole, although especially the first film is occasionally a little bit uneven - here and there you'll see a shot that's slightly softer that those around it. It's not due to problems with the transfer or mastering, but actual photographic issues related to the "down and dirty" nature of the location production. Colors are pleasing and generally accurate, though very occasionally appear a little desaturated. All of the first three films have been extensively restored so their color timing will vary somewhat from the previous DVD presentations. Contrast also varies a little bit, with blacks occasionally appearing a little crushed, but again on the whole the presentations are quite pleasing. There's no doubt that these films look better here than ever before on disc. The fourth film (Disc Four) is the newest and most even looking of the bunch, with neigh perfect contrast, flawlessly textured detail and a deep, warm looking color palate. The DTS HD 5.1 Master Audio mixes on each of these films are extremely satisfying. Overall fidelity is excellent. Dialogue reproduction is clear, surround channel use is lively and enveloping, the staging is smooth and natural at all times with plenty of deep, full bass. Sound cues both subtle and thunderous envelop and immerse you in the action throughout. John William's brilliant musical scores have seldom sounded so good. If there's any area in which this set somewhat disappoints, it's strangely here in the special features. Each film disc includes that particular entry's teaser and theatrical trailers in HD, including a Temple of Doom teaser that wasn't on the original 2003 The Adventures of Indiana Jones DVD box set. The rest of the extras are on Disc Five, and they include all 7 featurettes that were on the 2003 DVD set (The Light and Magic of Indiana Jones, The Sound of Indiana Jones, The Stunts of Indiana Jones, The Music of Indiana Jones, Making the Trilogy: Raiders of the Lost Ark, Making the Trilogy: Temple of Doom and Making the Trilogy: The Last Crusade) - basically everything else that was on the 2003 DVDs except the videogame trailers. Unfortunately, you don't get the Raiders of the Lost Ark Classic Featurette from the 2003 set's Best Buy exclusive bonus disc. 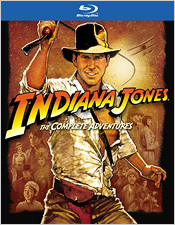 From the 2008 Indiana Jones: The Adventure Collection DVDs, you get 5 more featurettes (Raiders: The Melting Face, Indiana Jones and the Creepy Crawlies, Travel with Indiana Jones: Locations, Indy's Women: The American Film Institute Tribute and Indy's Friends and Enemies). But a lot more content from those DVDs is missing entirely, including 7 featurettes (Raiders: An Introduction, Temple of Doom: An Introduction, Last Crusade: An Introduction, Indiana Jones: An Appreciation - Indy IV Looks Back at the Original Trilogy, Storyboards: The Well of Souls, Storyboards: The Mine Cart Chase and Storyboards: The Opening Sequence) plus all the image galleries from each disc (Illustrations & Props, Production Photographs & Portraits, Effects/ILM and Marketing). Again, the videogame trailers are missing, though that's not much of a loss. From the 2-disc, 2008 Indiana Jones and the Kingdom of the Crystal Skull Blu-ray, you get 3 featurettes (Iconic Props, The Effects of Indy and Adventures in Post Production). Missing entirely are 5 more (Pre-Production, The Return of a Legend, Warrior Makeup, The Crystal Skulls and Closing: Team Indy), plus the interactive Timelines, all three of Pre-Visualization Sequences, at least one trailer and extensive galleries of production photos, portraits and artwork. Sadly, while the original Crystal Skull Blu-ray included a feature-length Production Diary: Making Kingdom of the Crystal Skull documentary, only a much shortened version appears in this new set under the title Making the Trilogy: Kingdom of the Crystal Skull. Disappointed yet? Us too. Fortunately, Lucasfilm does help soften the loss of all the other great material by adding a couple items that are completely new. The first is a vintage 1981 Making Raiders of the Lost Ark featurette that's never been released on disc before. The second - and by far the best extra included on this Blu-ray set - is Laurent Bouzereau's new 2-part On Set with Raiders of the Lost Ark documentary. It runs about an hour and comes in two parts - From Jungle to Desert and From Adventure to Legend. It's in full HD and is essentially composed of 16mm film footage shot on the set during the making of the original film, interspersed with abundant 35mm outtakes and deleted scenes from the film. It's a pure viewing delight. Essentially, you're a fly on the wall during all the critical moments of filming on the set, watching Spielberg, Ford, Allen and many others hard at work, having a good time and just basically at the top of their game. There are many antic moments to see here and the deleted scenes are extremely cool, including one that reveals (at long last) how Indy survived riding on the outside of that German U-boat across thousands of miles of ocean. Sure, it's implausible (which is probably why it was cut) but it's also pretty funny. For fans of these films, the material included in On Set is absolutely priceless. So a lot of good extras here were carried over from the previous DVD releases, but even more were left out and a bit of great new material was added. If you want to keep everything - all the special features that have been created for the Indy films, you unfortunately can't sell your 2008 DVD set and you can't sell your previous 2-disc Crystal Skull Blu-ray either. As long as you don't mind losing that videogame trailer, you can safely get rid of your 2003 DVD set - just don't let go of the Best Buy bonus DVD if you have it. The shame is that with the addition of just one extra BD disc, ALL of the missing material could have been retained here. Points added for the cool new material, but major points lost for the missing content. In the end, you'd have to say that the new Blu-ray box was worth the wait. The opportunity to see the older Indy adventures in HD at long last certainly justifies the upgrade price and the new Bouzereau doc clinches the deal. But there's no doubt that the omitted material is very much missed.